Sam Raimi's Spider-Man 2 is a crisis of confidence, a film more interested in the "why" of super-heroism than the "what" or "how." It's about the sacrifices we make to be heroes and the disillusionment that sets in when those sacrifices no longer seem worthwhile. 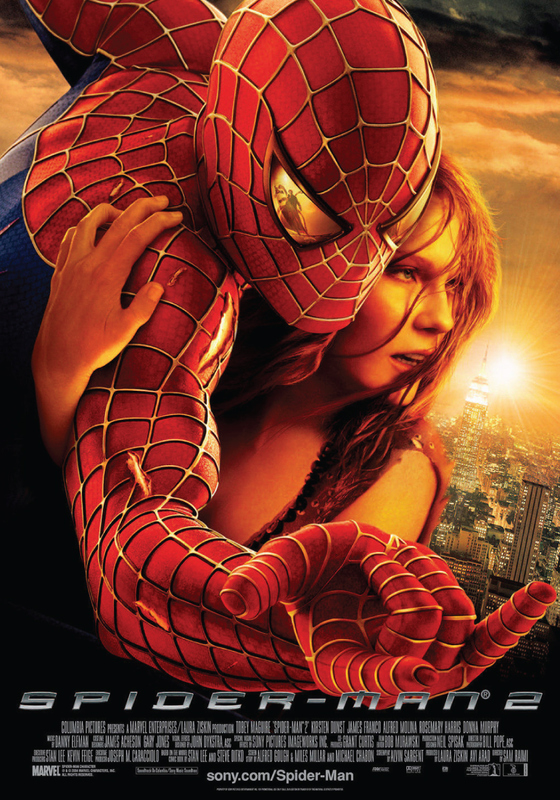 Whereas the first film teaches Peter Parker that great power equals great responsibility, the sequel challenges him to let go of that power in favor of more fulfilling life. But what Parker learns is that the real challenge is in finding balance, in being steady and accepting the fallible human with the inspiring icon. Meeting that challenge means sharing his burdens with those loved ones he swore to protect, even if it costs them their lives. The opening of Spider-Man 2 finds Peter Parker struggling to live up to the promise he made just a few years before, the promise to forgo his own personal happiness for the sake of heroism. The pizza delivery sequence, while zany and fun (that mops-in-the-closet gag is better than any attempt at levity in the MCU) is really there to illustrate that the world is closing in on him. In fact, the entire first act is committed to beating him senseless on all fronts: he's late for class, late for work, late on the rent, and too late to make the curtain for The Importance of Being Earnest, the play starring the girl of his dreams. It becomes very clear very fast that Peter simply has too much on his plate to be effective at any of the things he wants to do. Worse yet, his spider-powers are on the fritz. Impotence allusions aside, this plot point serves to make his inner conflict more clear: One assumes that the rewards of being Spider-Man would outweigh the costs paid by his merely mortal alter-ego, but that's where J. Jonah Jameson comes in. With just a few damning headlines, the Daily Bugle editor effectively turned all of New York against their friendly neighborhood Spider-Man. Imagine committing yourself to the immovable ideal of responsibility to your fellow citizen. Now imagine that citizen spitting in your face, rejecting your efforts, and actively trying to convince his neighbor that he's better off without you. Parker's gradual loss of powers mirrors the futility of his struggle, and it's no surprise that he finally elects to hang up his tights and look out for himself. That's when Spider-Man 2 does something interesting (and something that too few superhero films bother with): it introduces a foil in Dr. Otto Octavius. The brilliant and happily married all-purpose nuclear physicist represents everything Parker isn't (his work in fusion acts as a nice metaphor for what Pete's trying to achieve). Octavius' journey is the inverse of his own: he gives up his work/life balance in the maniacal pursuit of power and glory. It's only after that corruption becomes clear that Spidey realizes what he has to do: He has to lay down his burdens; he has to open up to those around him and share the immense gift and responsibility with which he's been endowed. Only then will he find the true meaning behind that gift and the true joy in its execution. First on Pete's tour of atonement is Aunt May. Pete's been haunted by his role in Uncle Ben's death for years, so his confession of responsibility and her acceptance double as cathartic relief and absolution of his guilt. It's a huge risk that pays off. It also opens him up to the possibility that his loved ones may be enlightened enough to understand his predicament and reinvigorates his interest in being a symbol for those citizens he thought were vilifying him. May's conciliatory attitude is actually foreshadowed during her confrontation with Octavius earlier in the film: notice that she gets to see Spider-Man's heroism firsthand. One assumes a noble and badass old lady such as herself would be willing to accept her husband's sacrifice if it breeds a hero of Spidey's caliber and grace. Ironically enough, Pete's most important act of atonement might be to those who know him the least. The L Train sequence forces him to fight without his mask, revealing his youth and humanity to those he nearly gives his life to protect (the crucifixion poses throughout are a nice touch). It's in that moment that the citizens who looked at him as a faceless and enigmatic menace understand the gravity of his sacrifice. Their bold (if ineffective) stand against Octavius assures Peter that he isn't struggling in vain, that he's just as inspirational as he had always hoped to be. More impressive though is that they promise not to tell anyone about what they saw. It's a gesture of personal respect and another step toward that balance between icon and mortal. But none of it matters if he can't get things straight with Mary Jane. She's a smart girl, after all, and she's always felt Peter's rejections were a bit disingenuous. Notice how the film chooses specific scenes from The Importance of Being Earnest to highlight her suspicions about Peter and his inability to be honest about his feelings. Notice the way she uses her relationship with John Jameson to provoke Peter to action and the way she intrinsically understands the connection between him and Spider-Man with the reenactment of the upside-down kiss. It's also worth noting that his revelation to her is unintentional and results from his decision to expose his identity to Octavius, the man he's trying to redeem. He appeals to his mentor's humanity and is rewarded with Mary Jane's acceptance of his own. She finally understands everything. From there, it's all about rewarding Peter's risk. The film's final scene is by far its best because it trusts Mary Jane to say what the audience has been thinking all along: we're all broken and flawed, but making our own decisions is our god-given right and cooperation is the key to getting through it. In this moment, both of them finally on the same page, Mary Jane elects life as Mrs. Peter Parker. The final shot (wisely invoking The Graduate) assures us that she'll pay a heavy price for that decision. It assures us that while Peter's loved ones are willing to shoulder his burden, it doesn't make that burden disappear. Most of all, it (and the closing song) vindicates Peter's excessive nobility and self-flagellation. We prove to Spider-Man that we are worth fighting for and he proves to us that the fight will continue.